A well-known herbal colon cleanser / bowel support combination, based on a famous formulation by master herbalist, Dr. John R. Christopher. The formulation has been amended in line with new EU laws. 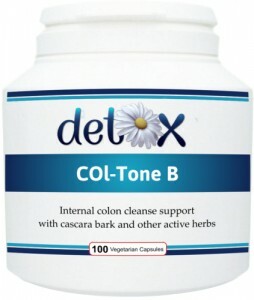 Popular with colon hydrotherapists, COL-Tone B contains 10 active herbal ingredients which help to soften the stool, stimulate the liver and improve peristalsis, which in turn produces bowel movements and expels layers of old encrusted mucus and faecal matter that may have accumulated over time. They gently stimulate and tone the bowel wall, supporting a move towards unassisted bowel movements. prior, following or between colonic hydrotherapy treatments. Ingredients: Rhubarb Powder, Capsule: Hydroxypropyl Methylcellulose (HPMC) (Vegetarian), Burdock Root Powder, Cayenne Powder, Fennel Seed Powder, Ginger Root Extract (20:1), Glucomannan Powder (90%), Anti-caking Agent: Magnesium Stearate (vegetable source), Aloe Vera Extract (200:1), Liquorice Root Extract (4:1), Barberry Bark Extract (10:1), Dandelion Root Extract (4:1). Dosage: 1 or 2 capsules to be taken 1 to 3 times per day or as advised. Not to be taken during pregnancy or breast-feeding. NOTE: Herbal colon cleansers are to be used in conjunction with improved dietary habits, increased water intake and a sensible exercise regime. Please read the section on constipation.